I'm excited to share new work produced for the US Pavilion of the Venice Architecture Biennale, included in the catalog for Dimensions of Citizenship and published simultaneously by e-flux architecture: a piece commissioned specifically to address the question of Citizenship at the scale of the Globe. My essay presents two New York City monuments—the Statue of Liberty and the Solomon R. Guggenheim Museum—as expressions of a smelted citizenship produced by the transnational copper extraction economy needed for the electrification and advanced telecommunications systems of the twentieth century and beyond, against the fiction of the US as melting pot. 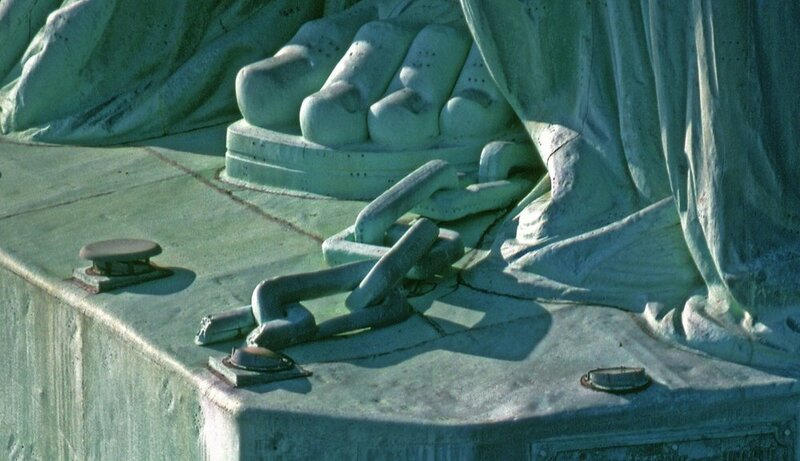 Foot of the Statue of Liberty. Image courtesy of National Park Service.